IE Singapore, the state-owned trade development board, is to partner with China Construction Bank (CCB) to finance projects on the One Belt One Road (OBOR) initiative. The move is designed to encourage Chinese companies to list in Singapore, which is positioning itself as a financial centre for the vast spending expected to take place. The MoU will see CCB provide S$30bn (about US$22bn) in funding to projects launched in Singapore on China’s OBOR programme. GTR catches up with Ho Chee Hin, group director (China), at IE Singapore to find out more about the arrangement. GTR: Are there particular areas of infrastructure you expect to collaborate on? Strategically located in Asia, Singapore is well-positioned to be Asia’s infrastructure hub, with its strong cluster of companies involved in various parts of infrastructure development. It is also a leading business centre with many financial institutions and specialists that have the expertise to undertake infrastructure project structuring and financing, which is key to the OBOR initiative. GTR: How important is Singapore’s open financial sector to the OBOR initiative? Singapore’s financial institutions can provide innovative and wide-ranging financing tools for infrastructure projects. It also has a large number of infrastructure players, with very strong design and engineering capabilities. For instance, Singapore is already extending its developmental expertise to Bangladesh in the power sector. 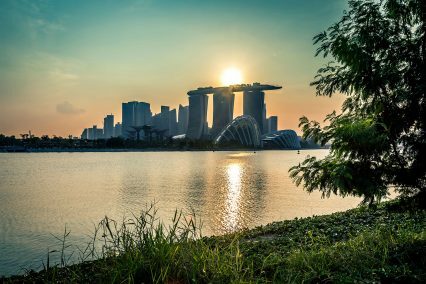 Given Singapore’s open and international financial hub positioning, financing options for green field infrastructure projects and infrastructure funds for equity are also available in the country. GTR: Hong Kong is aligning itself to be the financial hub for both OBOR and AIIB: does Singapore expect to compete with Hong Kong on this front? There is much potential for Singapore to play an active and leading role in the region as Asia’s infrastructure hub. We have globally-connected financial infrastructure, with the ability and appetite to fund infrastructure projects. We also have a strong pool of local companies that have developed innovative solutions, borne out of the constraints that Singapore faced in our development. Regionally, Singapore is well-connected to the regional market, which allows its neighbours to tap on our infrastructure and financial expertise available easily. The 8,000 multinationals based in Singapore can complement the knowledge pool with their market insights in Asia. Singapore companies have wide-ranging infrastructural capabilities, from airport management and water desalination to waste-to-energy plants. More importantly, they have strengths along the entire infrastructure value chain, from detailed planning, effective project development and engineering, to stringent procurement processes, and efficient construction and operations. Many of these companies have since grown into global players, sharing their expertise in capacity building, financing, project development and technical solutions with governments and institutions around the world. Companies such as Changi Airport Group, Hyflux, PSA and Sembcorp Industries have developed projects both locally and overseas that are fine examples of infrastructure projects. Our companies’ familiarity with doing business in Asia also makes them good partners to explore infrastructure projects in the region with. All these factors indicate that Singapore is in a good position to be a regional hub for the development, financing and execution of infrastructure projects.